In the midst of busily cleaning my house last night, I decided I’d finally dye the Kool-Aid Cowl. I pulled out my many packets of Kool-Aid, determined what kind of color I wanted to aim for, and got started. As per usual, I have difficulty following directions, but I used Knitty’s directions for the most part. I wasn’t really sure how the colors were going to mix together, so I did one packet at a time and tested with the edge of a paper towel (a trick I learned from another dyer). Obviously, I wasn’t going to see exactly what color the mix was coming out as, but it gave me an idea of what hue I was looking at. I used 6 packets of Kool-Aid altogether; 1 packet per ounce of wool. They were 2 orange, 3 strawberry, and 1 lemonade. 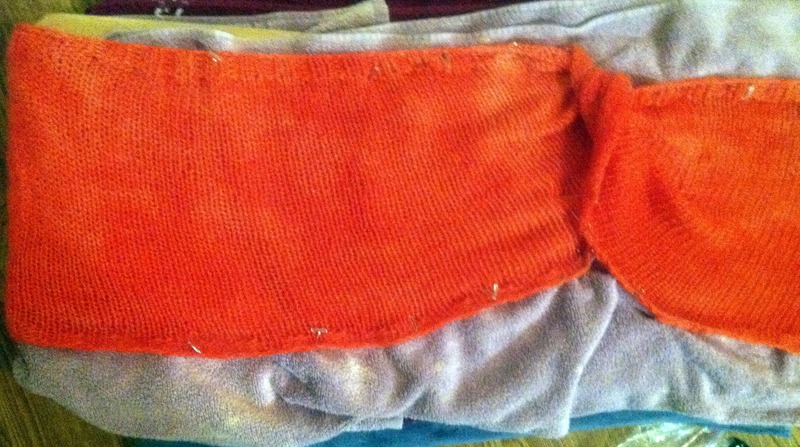 I took the wool cowl (which had been soaking as I got everything ready) and immersed it into the colored liquid. This is when I found out you should always wear gloves, even if dyeing with something as nontoxic as Kool-Aid. My hands turned the same shade the cowl would turn out as. I thought I was being terribly clever in my choice of microwaveable dishes. It had handles and was easy to carry, unlike most of my other microwaveable dishes. I brought the dish over to the microwave to find out that the dish didn’t even fit! Now, I don’t have a lot of things that can be microwaved, so this was a real set-back. I ended up pulling out one of my Paula Deen mixing bowls and throwing everything in that. Luckily, this dish fit, and I was able to get started. As per the Knitty directions, I microwaved the liquid and wool in 2-minute segments, allowing for several minutes in between so the wool could rest a bit. The directions say to go until the liquid is mostly clear but don’t give a real time frame as to how long that could take. It probably varies depending on a lot of factors: how fast the wool absorbs the liquid, how much liquid there is, the concentration of dyes, the type of microwave, etc. That’s my best guess anyway. It took me about 6-7 times before the liquid was mostly clear, which was great for house cleaning as I had something to keep me busy. 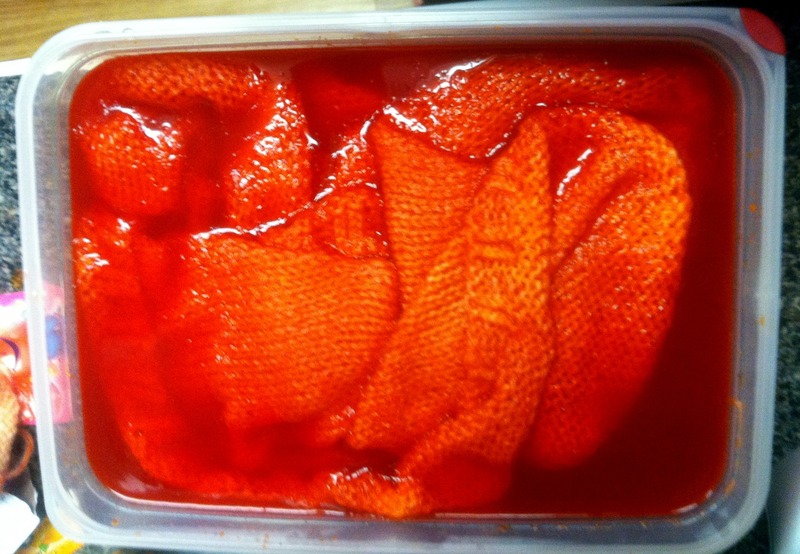 I pulled the wool out, let it cool for about 30 minutes and then rinsed it off. I’m sure I felted it a little bit; I’d be really surprised if I didn’t. Blocking techniques aren't great, but the color is fantastic! The cowl is now stretched out across a board and towels and is drying. I waited to try blocking it until this point. I’m hoping I’ve pulled out the curling. That’s one thing I haven’t figured out: how to get the fabric not to curl in the end. In other news, I received my Sock Ease sock yarn and set of large circ needles last night. 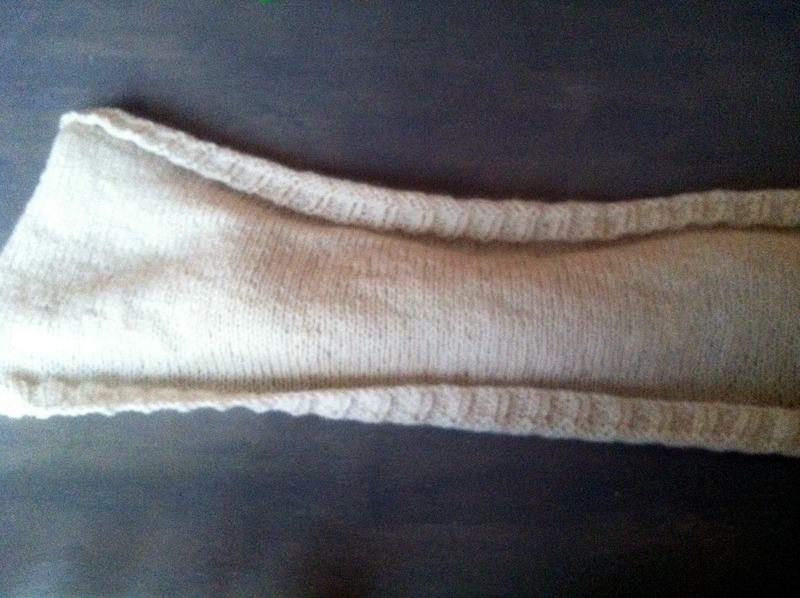 I’ve already cast-on for a new, short cowl (another one?) to try them out. I’ve never knit with plastic needles before, so this is a whole new experience for me.